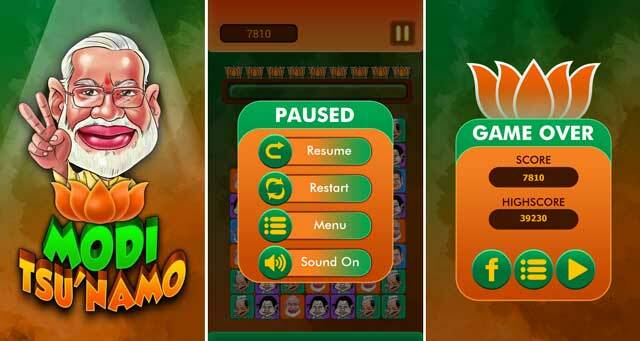 With the Modi-wave turning into a Modi Tsu’NaMo in the election results as well as on Twitter, to keep the ‘ache din’ going on, the Modi Tsunamo game was launched on Android. Milestone Interactive Private Limited has announced the launch of the Modi Tsunamo game for Android. The game is a simple yet quickly addicting arcade game where the player has to match at least 3 or more faces of in a single swipe to earn points. The faces include the most popular Indian election candidates including Narendra Modi, Rahul Gandhi, Arvind Kejriwal and Mamta Banerjee. Being in favour of the recent victory of Modi, combinations containing Modi will fetch more points than those containing any other leader. Also more number of faces in a single swipe result is higher points. The game can be downloaded for free from the Google Play store.